Nature’s Sunshine Anti-Gas Formula blends key herbs that aid in digestion and in expelling intestinal gas and soothing nausea. Papaya is a rich source of enzymes that assist the body with the digestive process. Another herb in the formula, ginger, is known for its soothing properties that help relieve nausea, while peppermint assists in expelling gas. 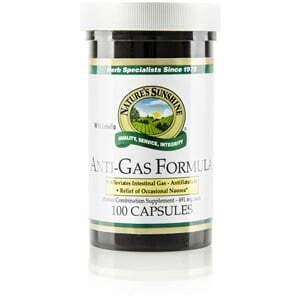 Catnip and fennel, also included in the Anti-Gas Formula, provide additional digestive benefits. Instructions: Take two capsules after meals three times daily.